Identifying the elements of credibility is important because a high score on one or two elements does not guarantee a high credibility rating. It’s the interplay that matters. For example, experts are usually considered highly credible, unless or until they are perceived as biased or self-serving. Lack of integrity can cancel out the positive impact of expertise. 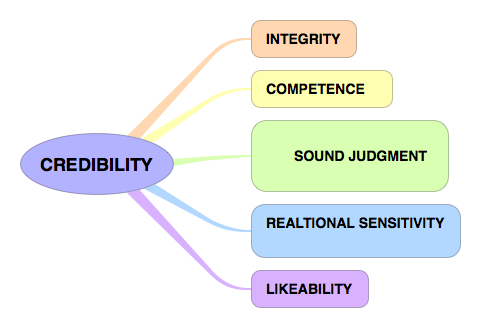 People assign you a degree of credibility based on how they rate you on the interaction of the elements of credibility: integrity, expertise, sound judgment, relationship sensitivity, and likeability. Perceived credibility is a package deal. Remember, too, that your credibility is based on observed behaviour, not on your intentions.